In a medium size bowl combine the water, brown sugar and cinnamon and whisk until mixed. Add the walnuts and toss. Place in a 400 degree oven for 8-10 minutes remove and cool. In a different medium size bowl combine the peaches, spinach, arugula, feta cheese, Peach White Balsamic Glaze and toss. Distribute the salad among 4 plates and garnish with the walnuts and feta cheese. 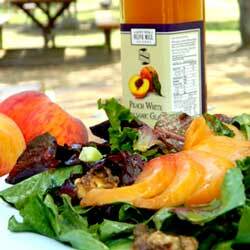 *If you can’t get this….yet 😉 I would use peach juice added to balsamic and reduce in sauce pan.